CoreLogic® (NYSE: CLGX), a leading global property information, analytics and data-enabled solutions provider, today released a new quarterly report featuring the CoreLogic Housing Credit Index (HCI™) that measures variations in home mortgage credit risk attributes over time—including borrower credit score, debt-to-income ratio (DTI) and loan-to-value ratio (LTV). 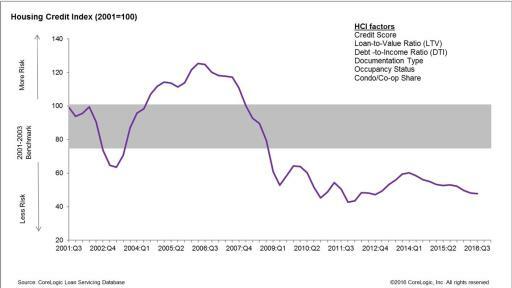 A rising HCI indicates that new single-family loans have more credit risk than during the prior period, and a declining HCI means that new originations have less credit risk. Credit Score: The average credit score for homebuyers increased 5 points year over year between Q3 2015 and Q3 2016, rising from 734 to 739. 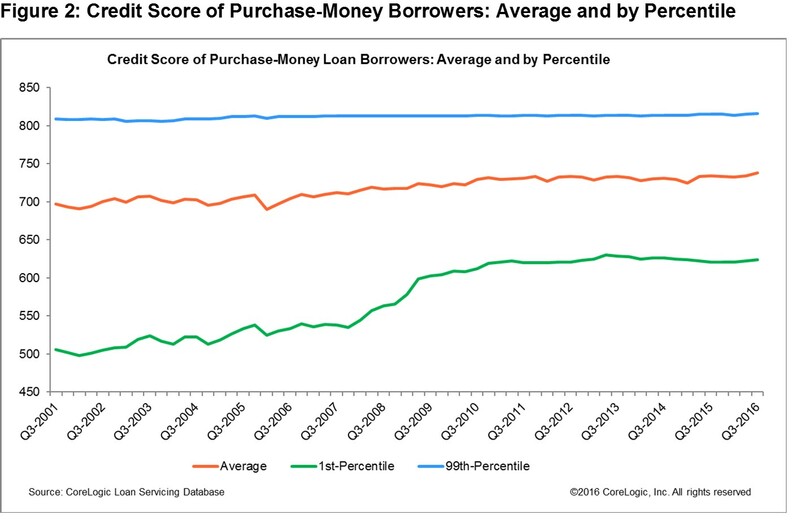 In Q3 2016, the share of homebuyers with credit scores under 640 had dropped by more than three-quarters compared with 2001. 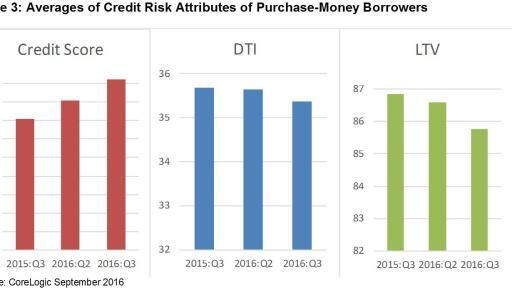 Debt-to-Income: The average DTI for homebuyers fell slightly between Q3 2015 and Q3 2016, falling from 35.7 percent to 35.4 percent. In Q3 2016, the share of homebuyers with DTIs greater than or equal to 43 percent was about the same compared with 2001. Loan-to-Value:The LTV for homebuyers decreased about 1 percentage point between Q3 2015 and Q3 2016, declining from 86.8 percent to 85.6 percent. In Q3 2016, the share of homebuyers with an LTV greater than or equal to 95 percent had increased by more than one-fourth compared with 2001. Figures 1 through 3 include originations through September 2016 (Q3 2016). 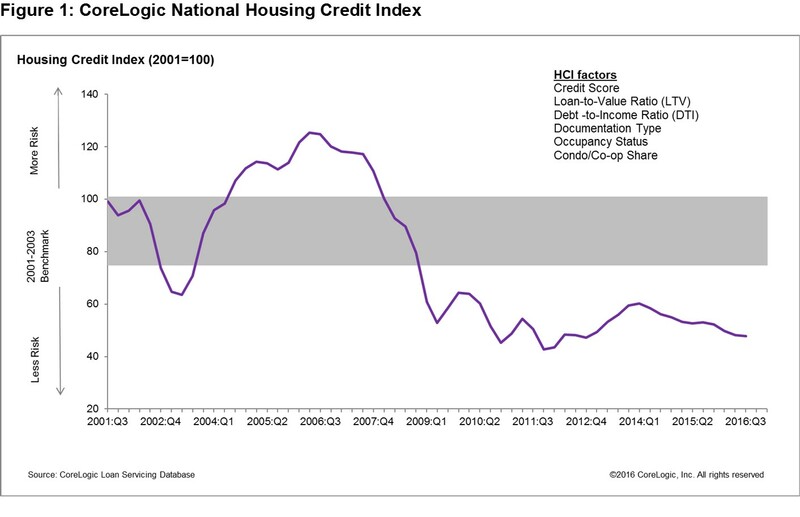 The HCI combines six mortgage credit risk attributes, including borrower credit score, loan-to-value (LTV) ratio, debt-to-income (DTI) ratio, documentation level (full documentation of a borrower’s economic conditions or incomplete levels of documentation, including no documentation), occupancy (owner-occupied primary residence, second home, or non-owner-occupied investment), and property type (whether property is a condominium or co-op). It spans more than 15 years, covers all loan products in both the prime and subprime lending segments and includes all 50 states and the District of Columbia, permitting peak-to-peak and trough-to-trough business cycle comparisons across the U.S. The CoreLogic prime and subprime servicing data include loan-level information, both current and historical, from servicers on active first-lien mortgages in the U.S. 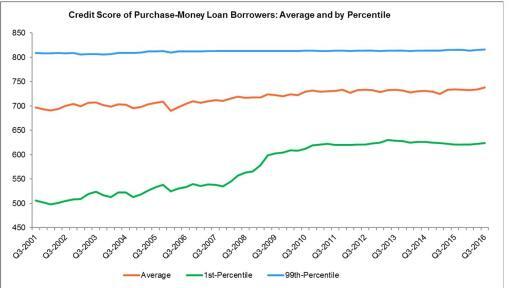 In addition, Inside Mortgage Finance (IMF) survey data and CoreLogic public records data for the origination share by loan type (conventional, government, jumbo, subprime) were used to adjust the servicing data to assure that it reflects primary market shares. These changes across different dimensions are reflected in the HCI. A rising HCI indicates increasing credit risk and a declining HCI indicates decreasing credit risk. The data provided are for use only by the primary recipient or the primary recipient’s publication or broadcast. These data may not be re-sold, republished or licensed to any other source, including publications and sources owned by the primary recipient’s parent company without prior written permission from CoreLogic. Any CoreLogic data used for publication or broadcast, in whole or in part, must be sourced as coming from CoreLogic, a data and analytics company. For use with broadcast or web content, the citation must directly accompany first reference of the data. If the data are illustrated with maps, charts, graphs or other visual elements, the CoreLogic logo must be included on screen or web site. For questions, analysis or interpretation of the data contact Lori Guyton at lguyton@cvic.com or Bill Campbell at bill@campbelllewis.com. Data provided may not be modified without the prior written permission of CoreLogic. Do not use the data in any unlawful manner. These data are compiled from public records, contributory databases and proprietary analytics, and its accuracy depends upon these sources.